Funeral services for Rosa McWhorter Allphin age 95, of Spring and formerly of Madisonville will be held at 11 A.M., Wednesday, August 8, 2018 at the Madisonville Funeral Home Chapel in Madisonville. Phillip Whitworth will officiate the service, and interment will follow in the High Prairie Cemetery. A brief visitation will be held Wednesday morning from 9 A.M. until service time at the funeral home. Rosa Verona (Wolfe) McWhorter Allphin was born September 1, 1922 in Leona, Texas to Marvin Tyler, Sr. & Corine (McGill) Wolfe. At an early age, her family moved to Madisonville where she grew up. Rosa was a homemaker for most of her life and sold Avon Cosmetics. She married her high school sweetheart, Charles “Lee” Allphin, in 1996. 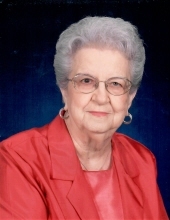 Rosa enjoyed writing, painting and crocheting and was a faithful member of First Baptist Church in Madisonville. She had many friends in Madisonville, all of which will miss her dearly. Rosa passed away August 2, 2018 in Spring, Texas. She was preceded in death by both of her parents; first husband, Vernon “Mack” McWhorter; second husband, Charles “Lee” Allphin; sons, Jan “Tiny” McWhorter and Kent D. McWhorter and sister, Katherine Sandel. Surviving family members include son, C. Jay McWhorter (Mary) of Houston; daughters, Myla Kay Johnson (Jack) of Houston and Debra A. Hill (Larry) of Houston; brother, Marvin Tyler Wolfe of Houston and grandchildren, Melissa K. Johnson, Erin McWhorter, Neil McWhorter, Jason McWhorter, Royce Wolfe, Ryan Wolfe, Jenni Weeks, & Laura Swann. Rosa is also survived by fourteen great grandchildren and numerous extended family and friends. To send flowers or a remembrance gift to the family of Rosa Verona McWhorter Allphin, please visit our Tribute Store. "Email Address" would like to share the life celebration of Rosa Verona McWhorter Allphin. Click on the "link" to go to share a favorite memory or leave a condolence message for the family.